A bouquet that is perfect for any occasion! One dozen eye-catching Gerbera daisies in a wide array of colors are bursting into full bloom from a glorious foundation of fern fronds and foliage. 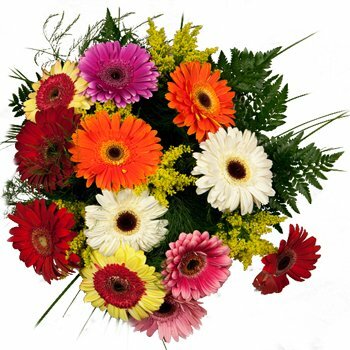 The perfect gift from secretaries to employees, to say Get Well Soon, as a housewarming gift, or just to say I'm Thinking Of You, the Gerbera Explosion Bouquet is sure to make your loved one smile.